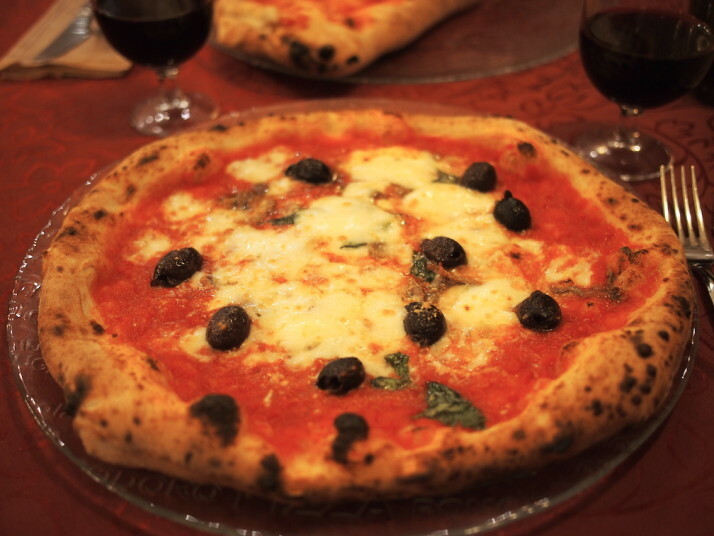 What photo takes you right back to Sicily? 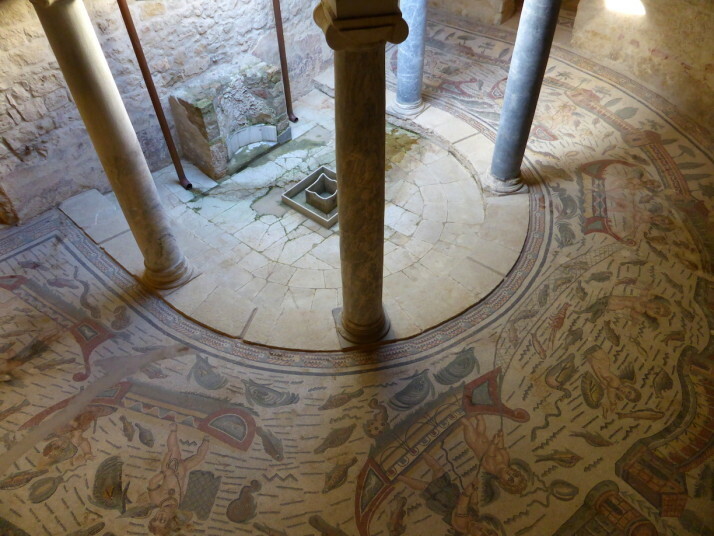 There are many, many layers of history in Sicily. 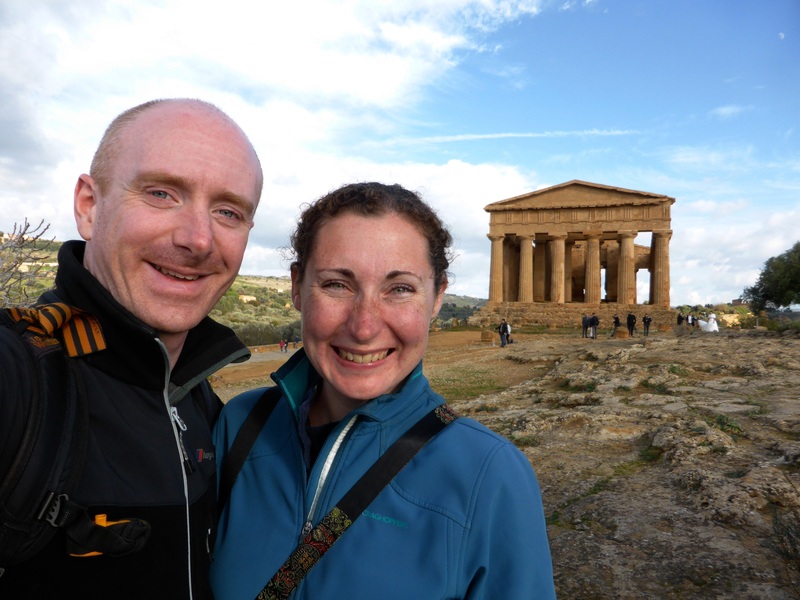 One of the oldest sites that we visited was the Valley of Temples in Agrigento. Summarise Sicily in three words. 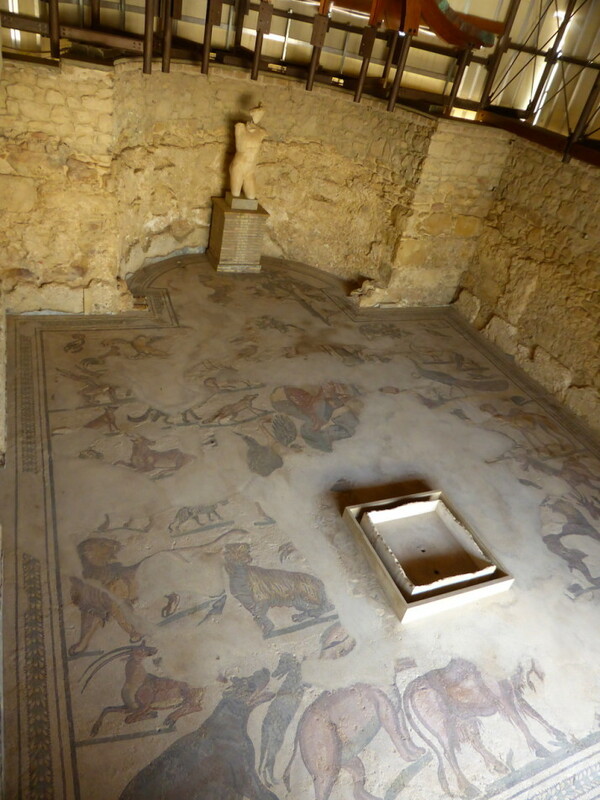 Theatrical – Not only is the island littered with old Greek and Roman teatros, but the people are pretty dramatic too – we had to laugh on our first day when we saw a guy having a loud, flamboyant conversation waving both arms around while driving his car! 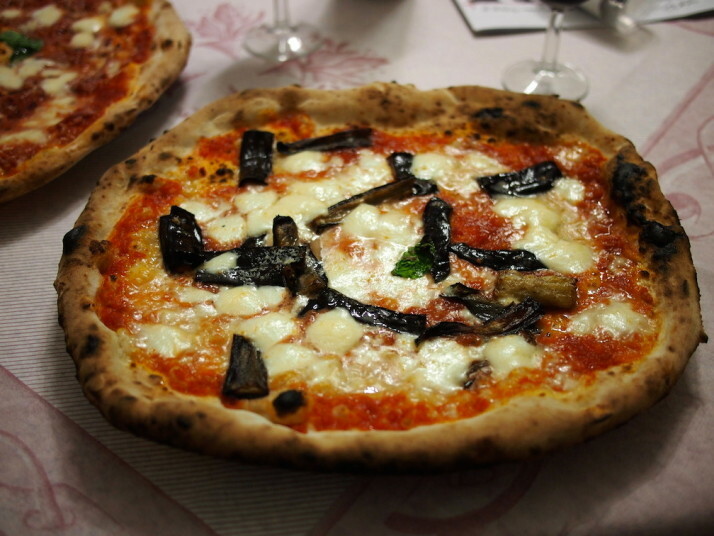 Patriotic – Sicilians are proud of their island, its history and its delicious produce. Fortunately they love sharing it with visitors too – we were constantly offered free samples of food and advice on places to visit. …you have to watch your step to make sure your shoes stay clean. Unfortunately the streets are full of litter and, even worse, dog poo. What one item should you definitely pack when going to Sicily? An empty stomach. 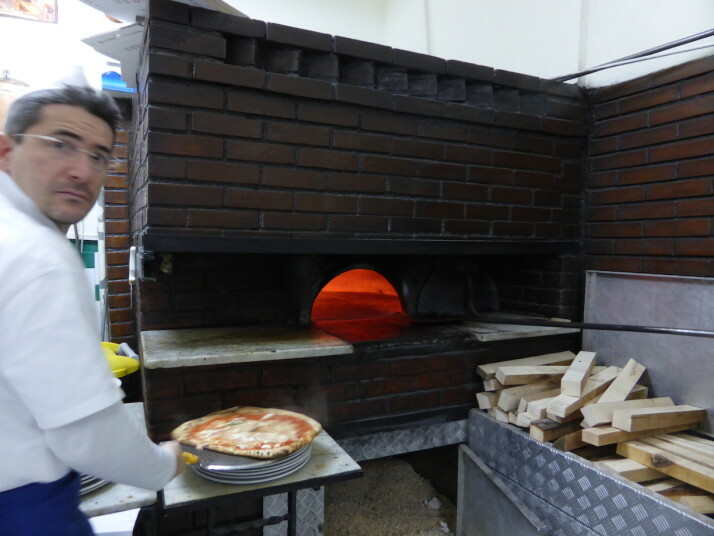 The food is fantastic, whether in fancy restaurants, on the streets or from the markets. 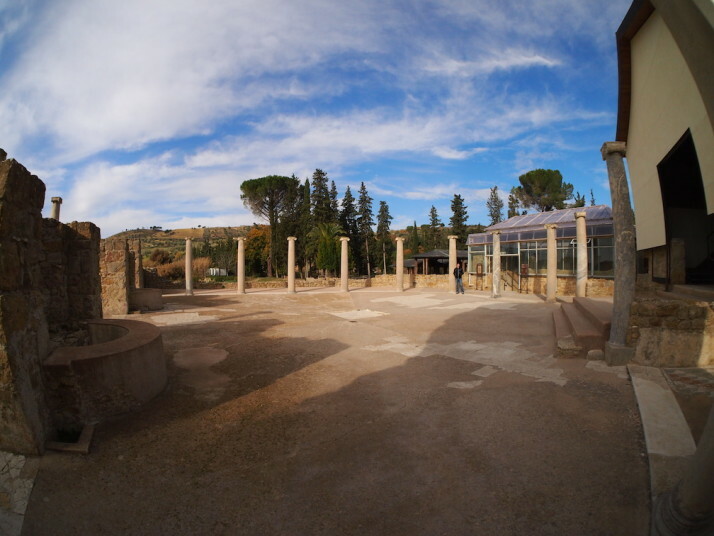 This entry was posted in Places and tagged Italy, Round Up, Sicily on January 27, 2015 by Julie. 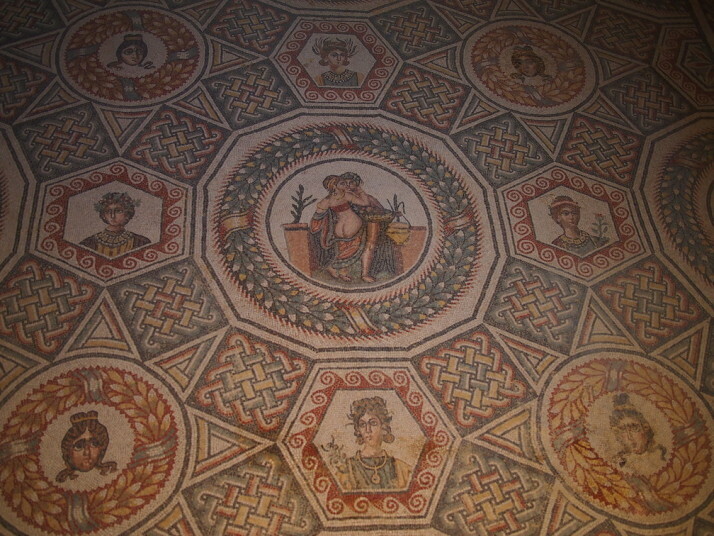 Villa Romana del Casale was a large Roman villa almost in the centre of Sicily whose remains include the best collection of Roman mosaics in the world. We’d originally planned to visit the volcanic island of Stromboli on our way to the Italian mainland, but when we found out the hiking tours were cancelled because it was likely to erupt again after the spectacular eruption 5 months ago in August, we changed plans and jumped on a bus to Piazza Armerina, a small town near Villa Romana de Casale. And we’re so glad we did instead of heading straight to Naples.. 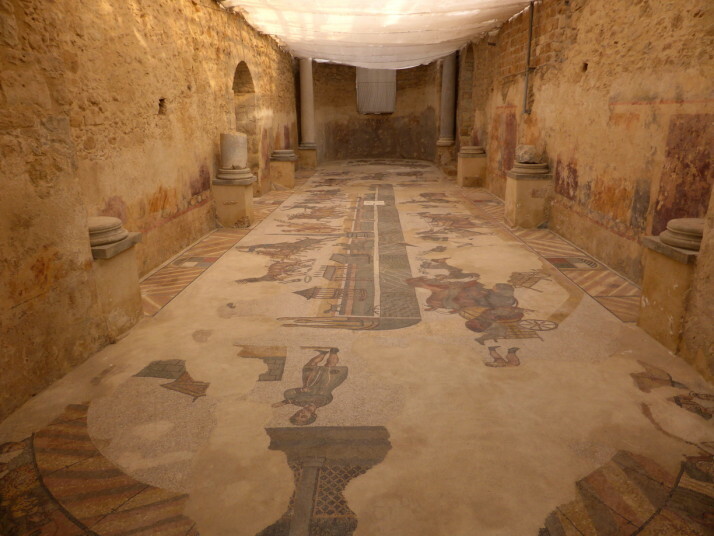 Originally built in the 4th century on the site of an existing villa, it was expanded a number of times before possibly being damaged or destroyed by invaders. Parts remained in use throughout the Byzantine and Arab periods until a massive landslide in the 12th century almost completely covered it. 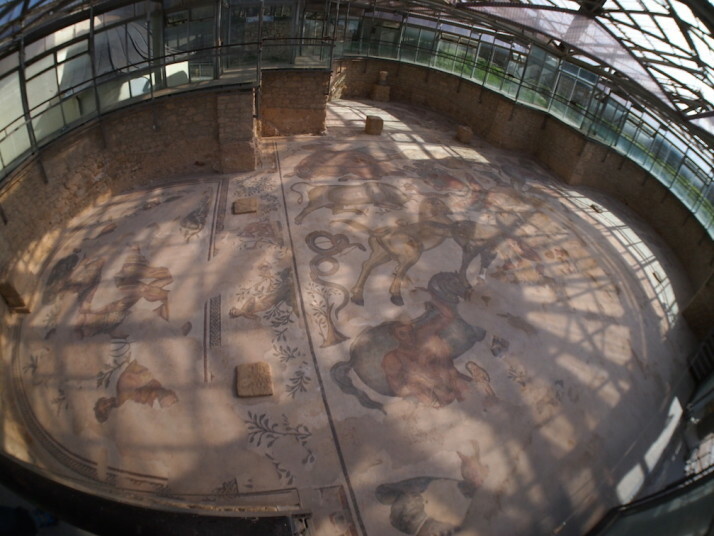 Forgotten, the area was turned over for cropland for nearly 700 years until the 19th century, when bits of mosaic and columns where found, leading to the first professional archaeological excavations in 1929. There are many nice things about travelling off-season: generally the transport is cheaper (if it’s running); accommodation is easier to find (if it’s open); but our favourite benefit is the reduced crowds at tourist attractions (if they too are open). 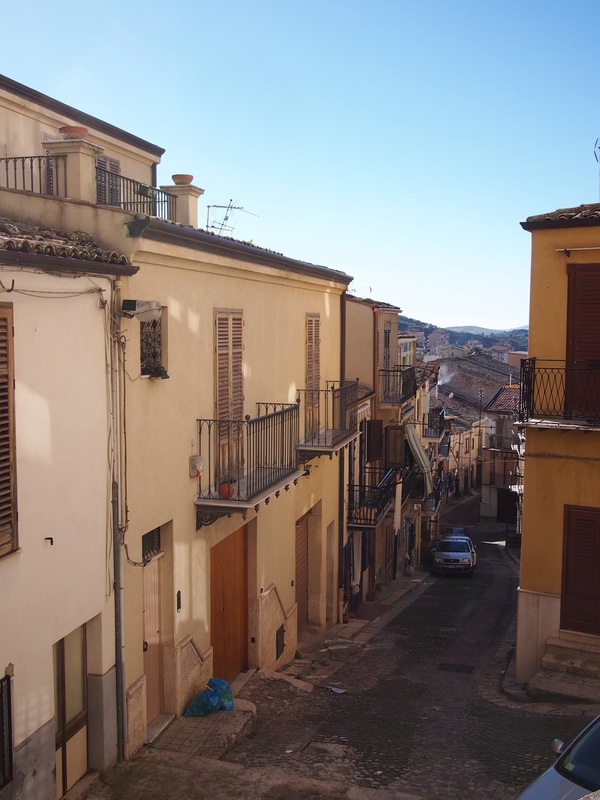 We’ve stayed with some lovely hosts in Sicily and Piazza Armerina was no exception, but the shorter winter days meant the shuttle busses for the 3km trip out of the town to the villa weren’t running. Having risen early intending to hike our host was having none of it and insisted he take us in his car! 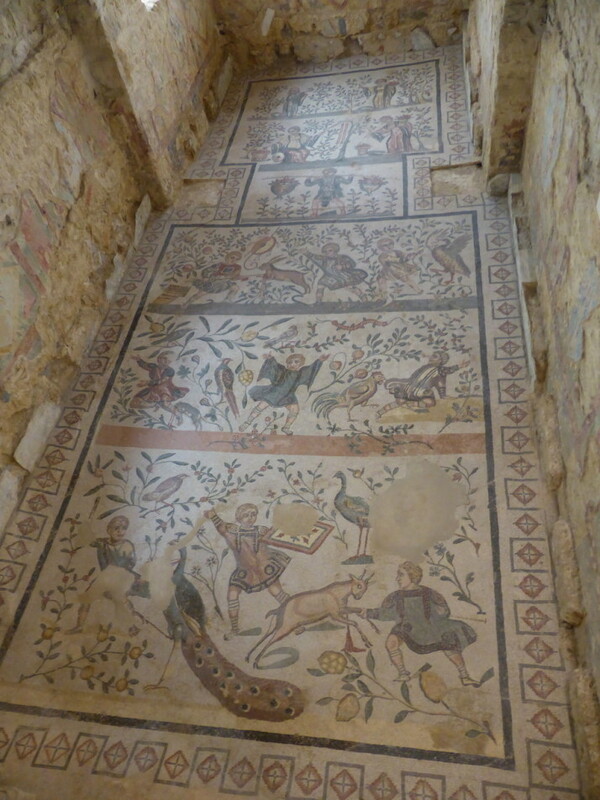 We arrived just a few minutes after it opened and we saw 2 other couples as we walked around, then a group of 6 or so just as we were leaving, so we had the whole place to ourselves and really took our time to study the stunning variety of mosaics and read the excellent information boards. 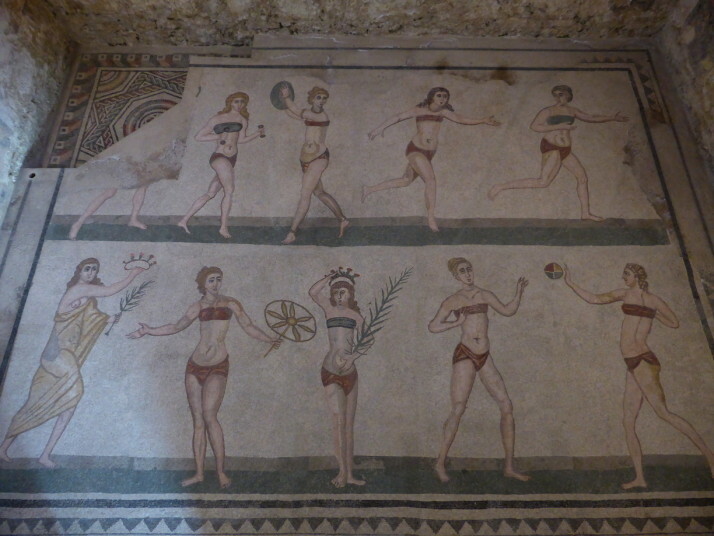 Probably the most famous of the mosaics in the villa – that of the nicknamed “bikini girls”. 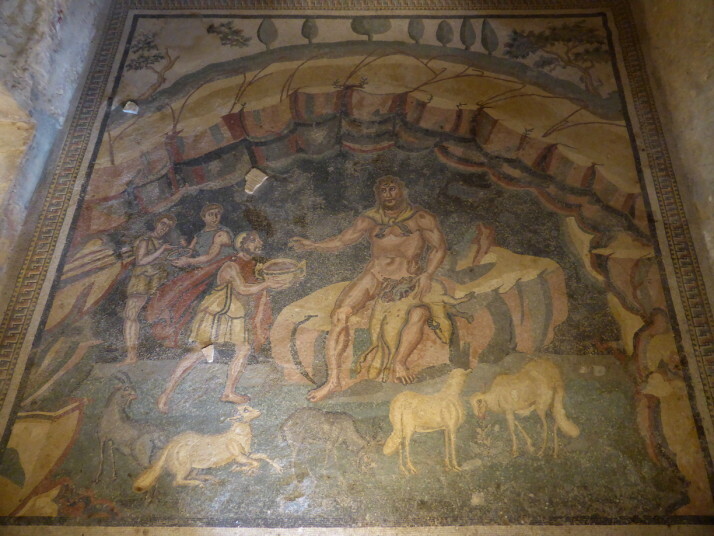 They’re actually athletes dressed in a light outfit for competition consisting of a strophium and subligar. 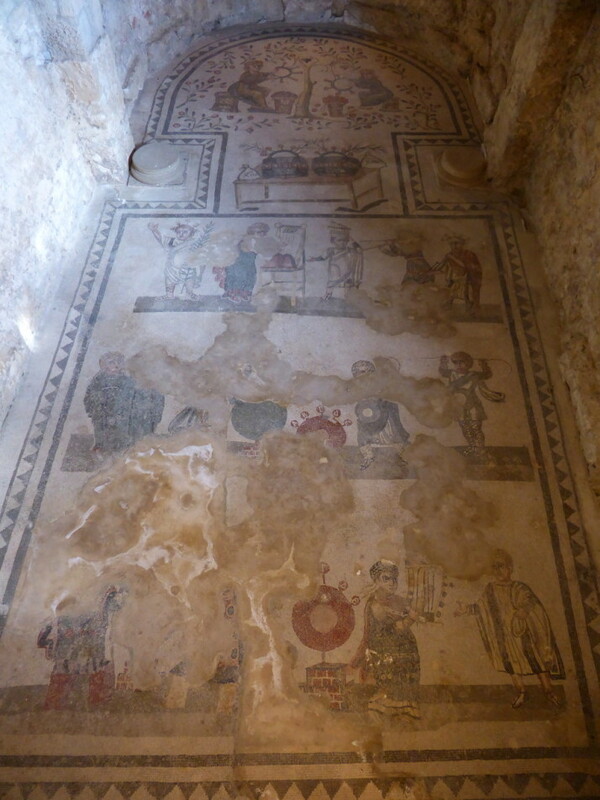 The almost fully-clothed figure in the bottom left is handing the winner a crown of roses and a palm branch. 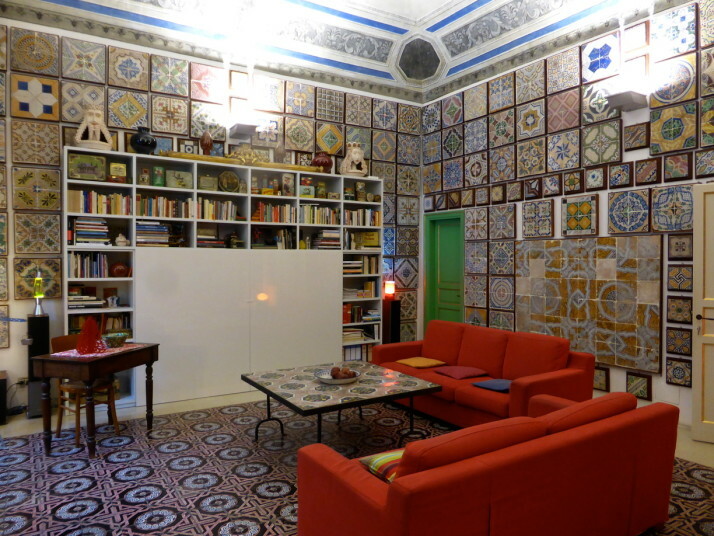 In the top-left is an earlier geometric pattern which was replaced, probably due to a change of function or use, but check out the vivid, vibrant colours – we tried to then imagine the entire villa like this. Wow! This is the other bedroom of the master’s private apartment. 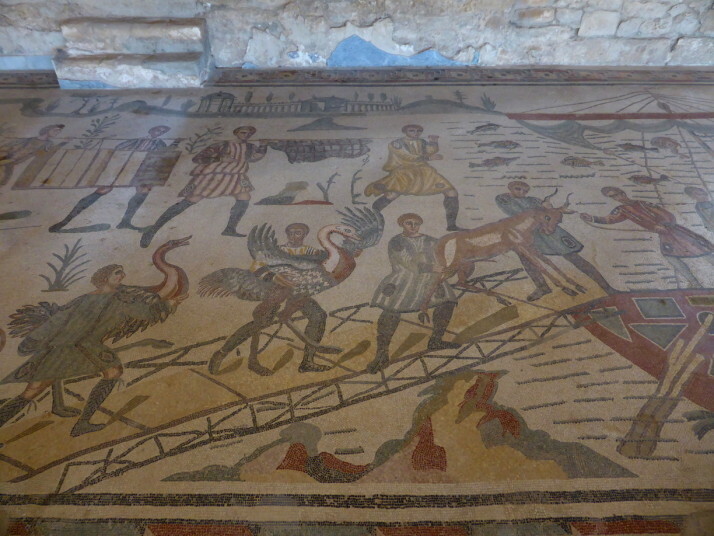 This time the flooring depicts children trying to capture barnyard animals, though not as successfully as their elders in the “great hunt” – one is bitten by a rat and another falls to the ground after being chased by a giant rooster! 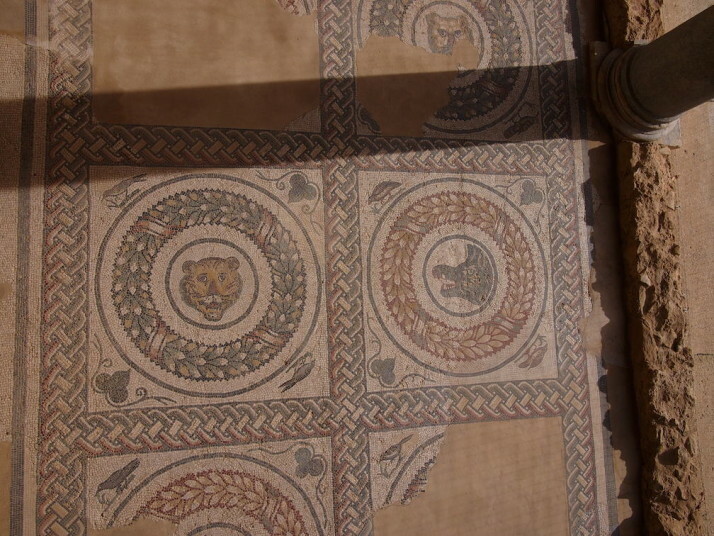 We were very fortunate with the weather, but although it was a bright, clear day, most of the mosaics are inside the villa and the protective roof meant that we got a little chilly. After a good 3½ hours following the route, we warmed up with a spot of lunch on a bench in the car park in the sun before hiking the 5km back into town. 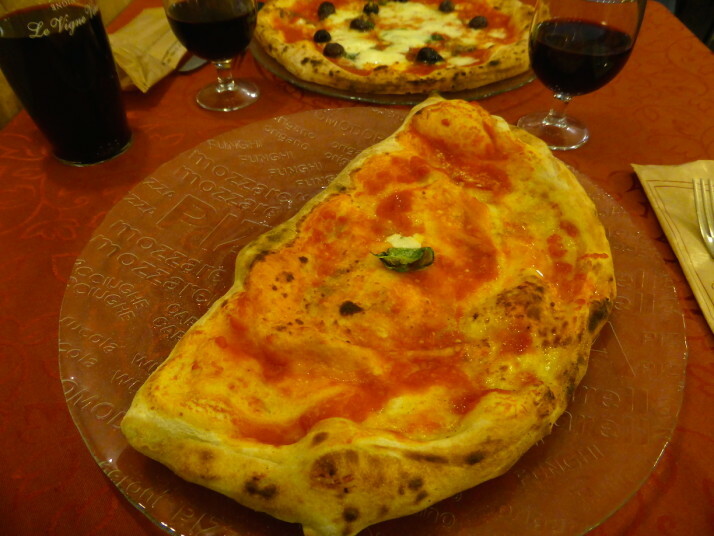 We’ve added Stromboli to our ever-increasing list of places to come back to, but we’re so pleased we decided to visit Villa Romana del Casale. 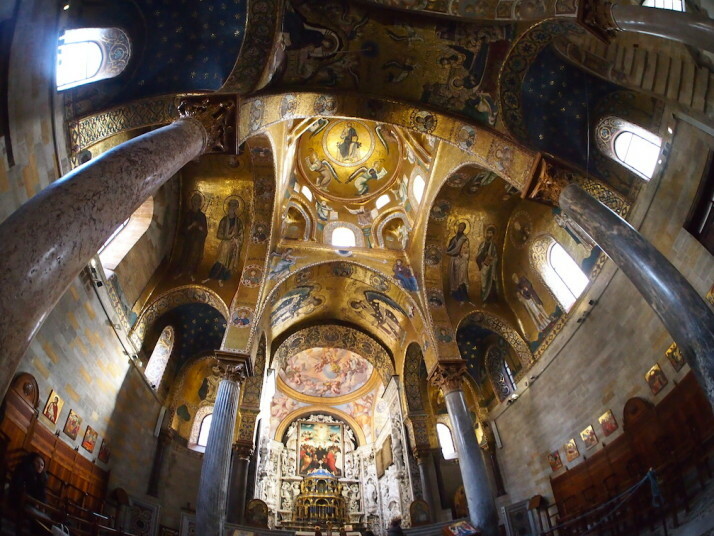 Not only are the mosaics simply amazing – and that’s saying something after Monreale Cathedral and The Church on Spilled Blood – but I think that means we’ve been to every UNESCO World Heritage site on Sicily! 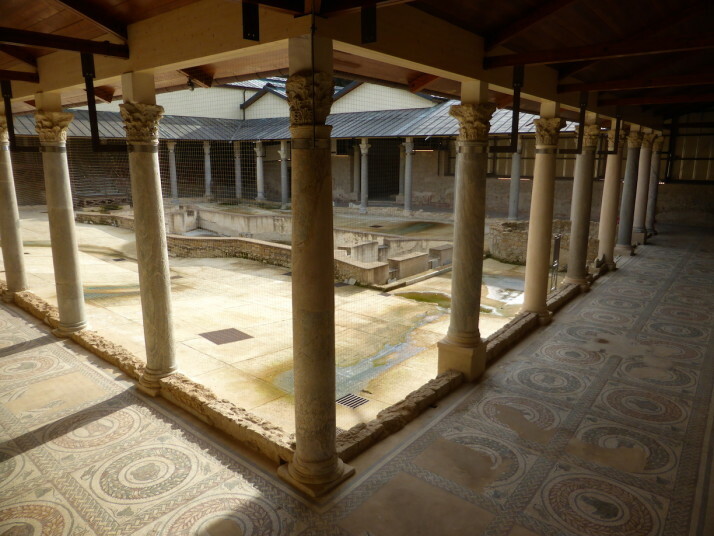 This entry was posted in Places and tagged Italy, Museum, Piazza Armerina, Sicily on January 25, 2015 by Andrew. If the name Corleone sounds familiar it might be because it’s the name of the Mafia family in the trilogy of Godfather films (and the book that they were based on). 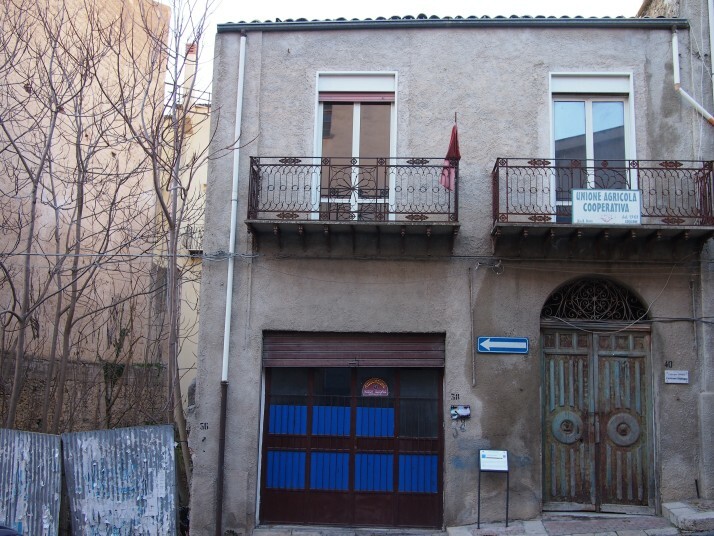 In real life, Corleone is a small town with a population of about 12,000 situated in the hills of north western Sicily. It has long been associated with the Sicilian Mafia, with many of the most notorious ‘bosses’ of past years having their roots in the town, but now it is trying to break free of its reputation, spearheading a campaign to rid Sicily of organised crime and corruption. It’s about a 90 minute bus ride up into the hills from Palermo. We arrived just after lunch and found a sleepy place with all of its shops closed for the afternoon. We wandered the narrow streets following the ‘Justice and Legality’ route past some of the places associated with the anti-mafia movement, for example, the spot where Bernardino Verro, an early 20th century Socialist mayor and peasant leader, was assassinated by the Mafia, and the ‘People’s House’ founded by Verro to house the ‘Cooperative Agricultural Union’ a symbol of the local peasants’ struggles against the rich landowners and organised crime. At 3pm we arrived for our tour of the International Centre for Documentation on the Mafia and Anti-Mafia Movement (CIDMA). CIDMA was founded in 2000 to raise awareness about and fight against the Mafia in Italy and worldwide by pursuing legality. There was no response to the doorbell and we were just checking our email to find a phone number when our guide bustled up and ushered us inside. 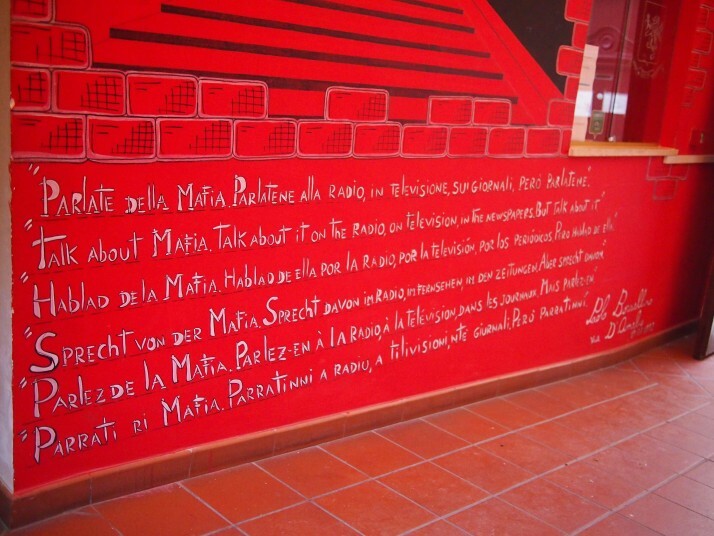 After explaining the aims of CIDMA, she showed us the first room which is dedicated to the memory of two Sicilian judges, Paolo Borsellino and Giovanni Falcone. In February 1986 they began the Maxi-trial to try 475 mafiosi. 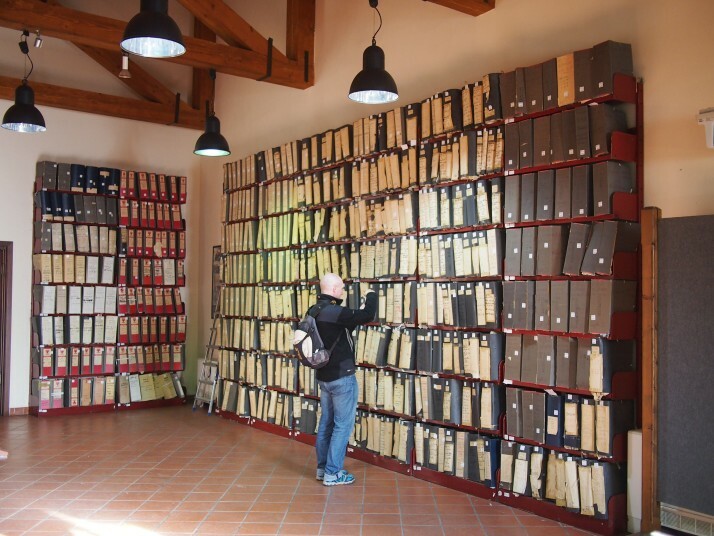 The room contains copies of all the trial’s documentation, shelf after shelf of binders which ultimately led to the conviction of 360 of the accused. 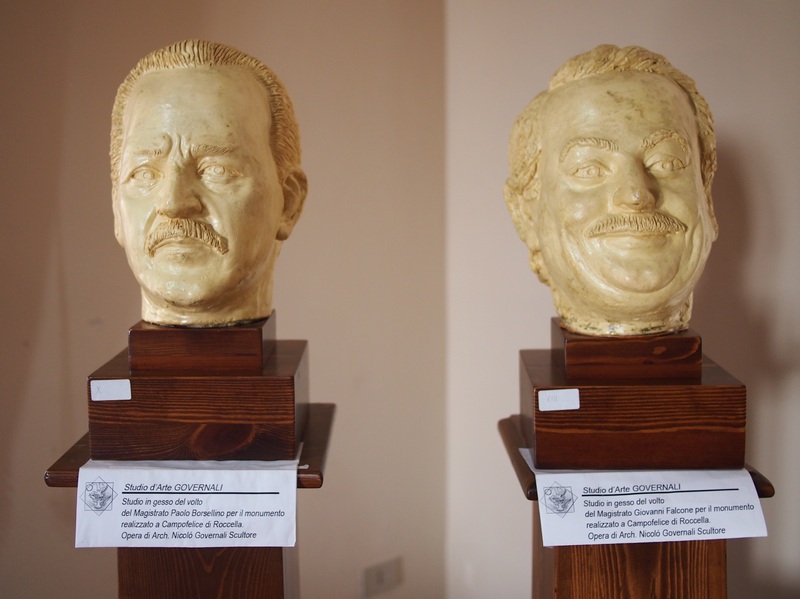 CIDMA is only possible because of the actions of brave people like Borsellino and Falcone who opened up the Mafia’s secrecy and allowed it to be spoken about publicly. But they paid for their bravery, both were murdered, along with their police bodyguards, for their stance and as a warning to others considering speaking out. 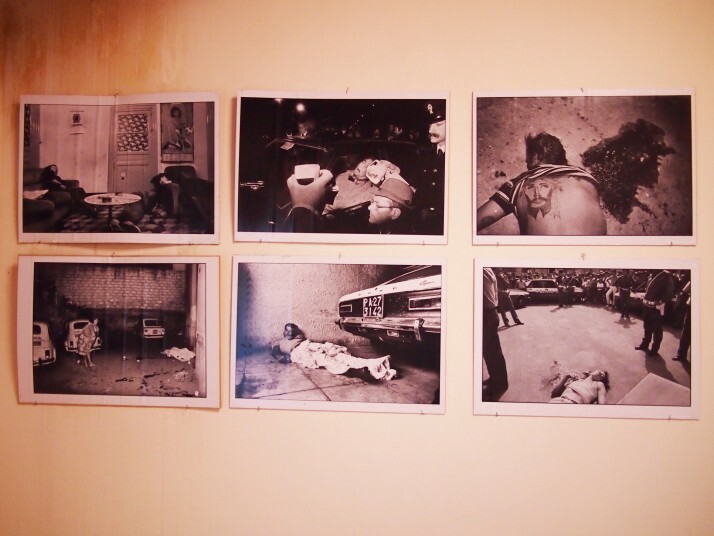 The following rooms contained some shocking and brutal images taken by Sicilian photojournalist Letizia Battaglia during the 1970s and 80s of Mafia killings, as well as photographs by her daughter Shobha showing the effects of the killings on the victims’ families. Our guide used these to explain the reality of a life lived in fear of organised crime as well as the messages sent by the mafiosi in the way the bodies were left. 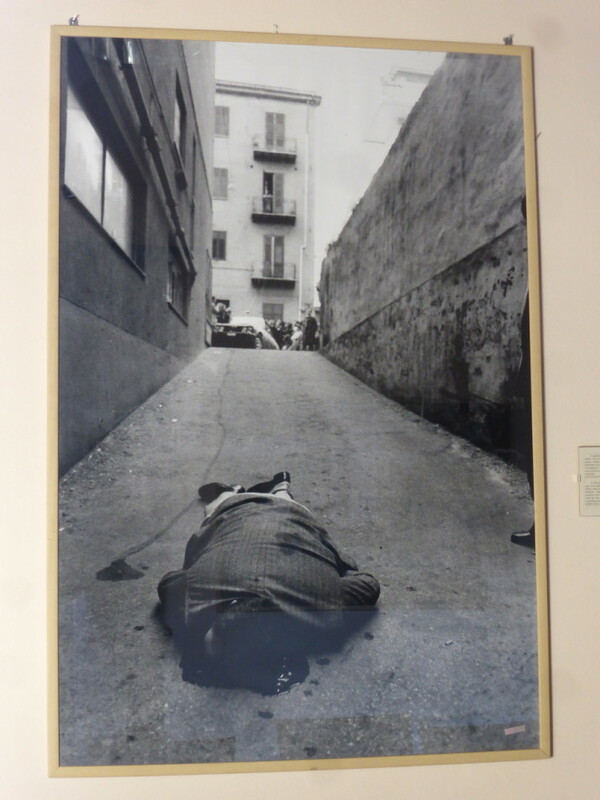 We were particularly struck by the image of a man who was killed while on his way to collect his car from an underground garage, and the symbolism of how his murderers arranged his body. He was dragged down the slope below street level (he was unimportant), he was placed with his face down (to show he had seen something that he shouldn’t have but wouldn’t again) and his hands were in his pockets (he wasn’t active in the Mafia, just an innocent in the wrong place at the wrong time). 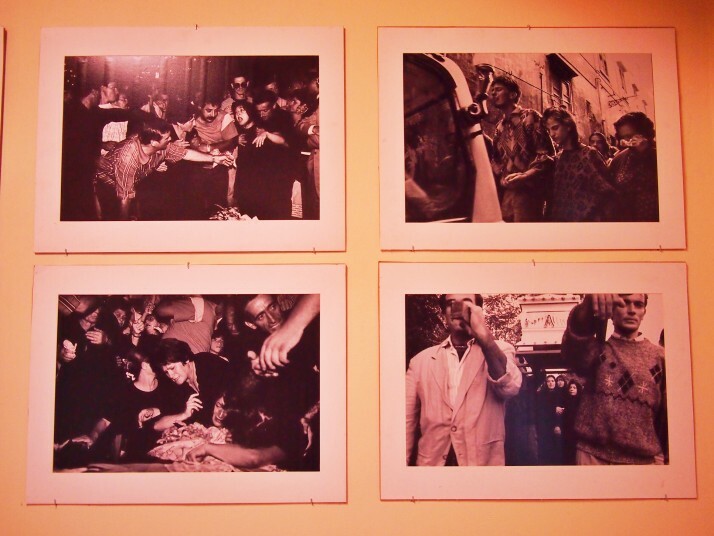 Meaning that because of a lack of support from the state, and the power of the Mafia, people died. 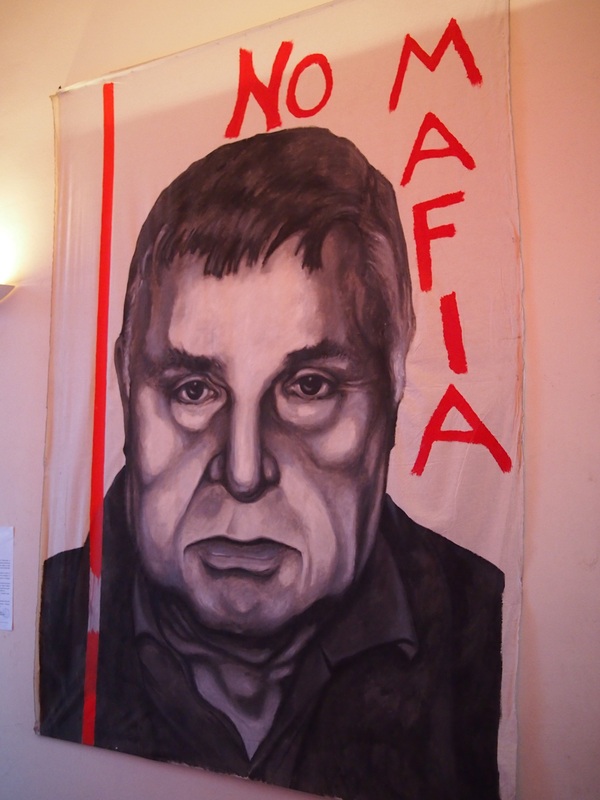 We were shocked that the Mafia is still active, sure there isn’t the same level of violence and fear that there used to be but ‘silent’ mafiosi are still running organised crime reliant on corruption within the authorities. 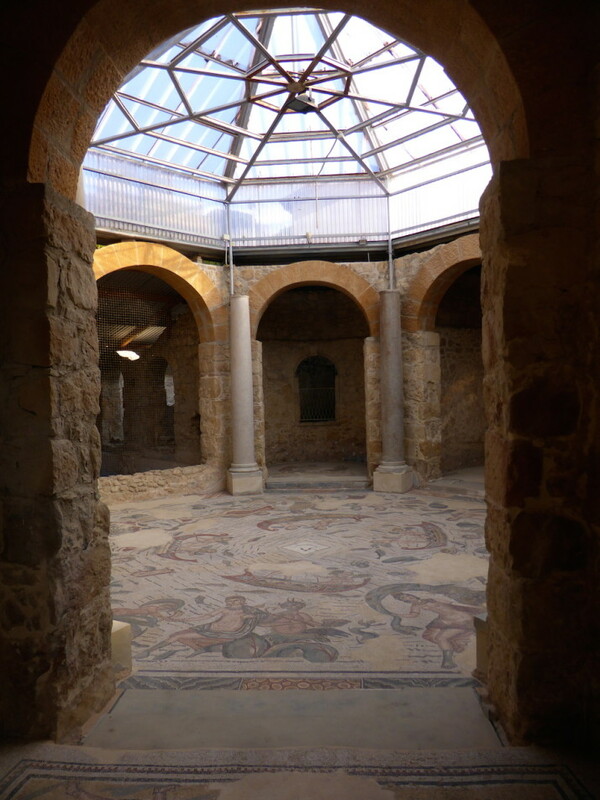 This entry was posted in Places and tagged Corleone, Italy, Museum, Sicily on January 21, 2015 by Julie. 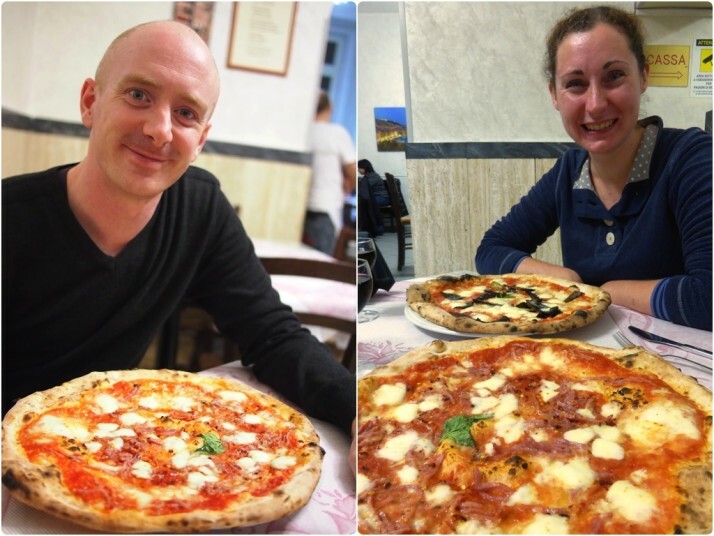 Having enjoyed our time in the second largest Sicilian city of Catania, we were equally looking forward to Palermo which is the largest. Anticipating that it would be a larger version of the same, we weren’t at all disappointed, there’s more to do and more to see. Also like Catania we found ourselves a nice little apartment with a kitchen so we could make full use of the Sicilian markets when were weren’t out trying the local street food. 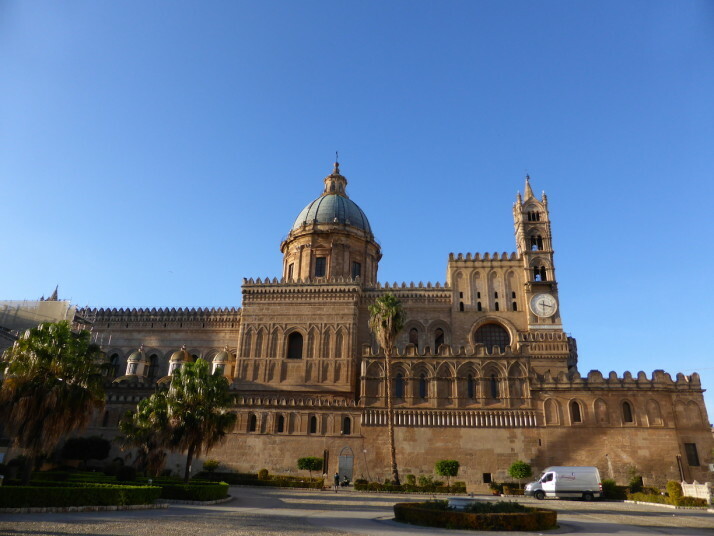 Built in 1185 on the site of a former Byzantine church, Palermo’s cathedral, like the Monreale Cathedral that closely preceeded it, is a hodgepodge of the styles and influences of multicultural Sicily: Norman, Arab, Gothic, Baroque, and Neoclassical. 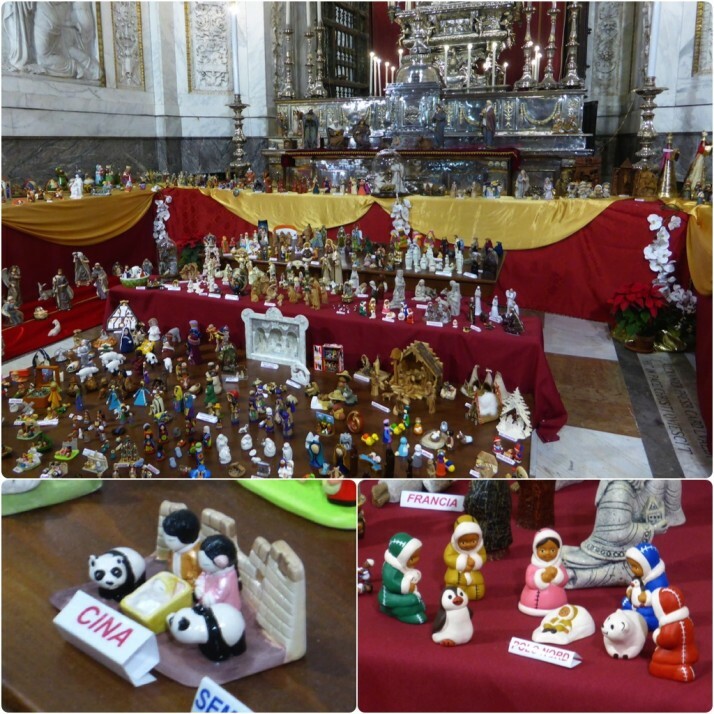 A nice surprise was the international nativity scene made up of models from around the world! We were staying not far from the cathedral, and even though we passed nearly every day, we couldn’t help taking photos of the outside apse end! Outside of the nave at the rear of the cathedral was our favourite part, we just couldn’t help taking photos of it every time we passed! 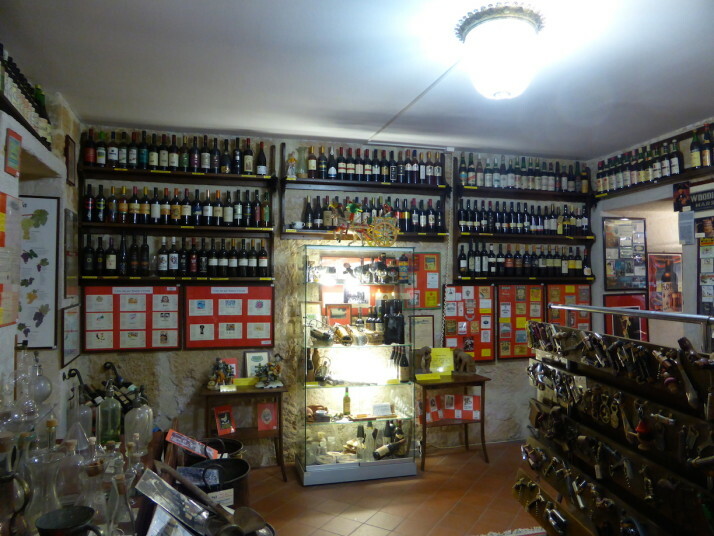 On our first night in Palermo we found our local enoteca or wine shop, run by a young guy who, while filling up a two litre water bottle with Nero d’Avolo for us gave us a ¾ plastic cup to taste, then the same of the house white, followed by a small taster of the house moscato! 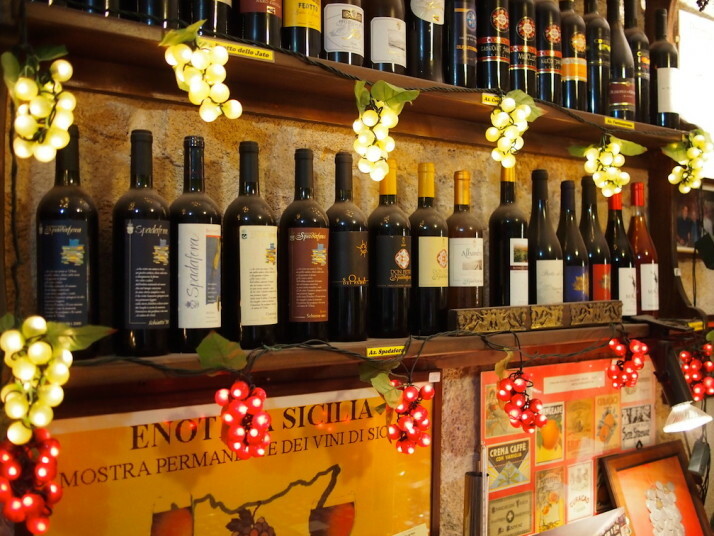 As we’d enjoyed them all we decided it’d be a good idea to find out more about how Sicilian wine is made so we booked a tasting at the Enoteca Sicilia. 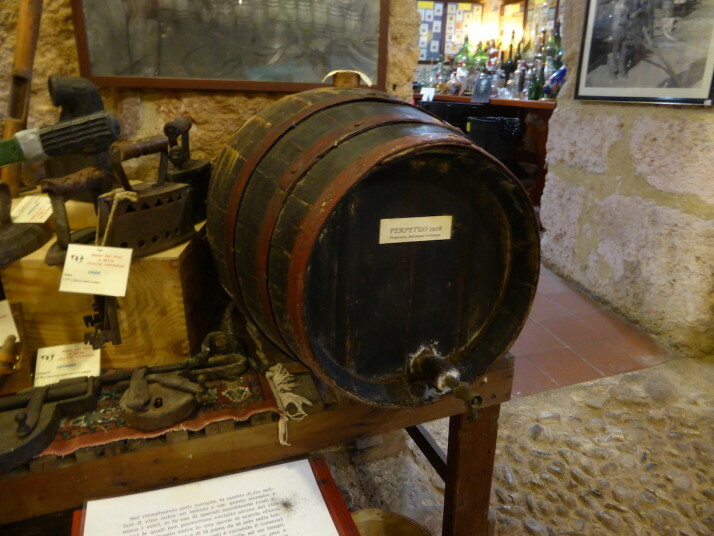 Guido Ferla explained that every year 10% of this barrel has been taken out and replaced with 10% new wine since 1928. It smells fantastic! This very impressive collection of all things wine related appears to be very much a personal labour of love. The underground Aladdin’s caves are packed with memorabilia, tools, bottles, labels, maps and has a small bar where we received a small glass of wine. The President of the museum, Mr Guido Ferla met us and explained, in English, that he didn’t speak English, which is fine with us and so we thought we’d spend the next hour or so wandering through the museum on our own. However, he then proceeded to show us around pointing out some of the more interesting artefacts with a little English explanation! It was as good as some of the tours we’ve had that are advertised as being in English! 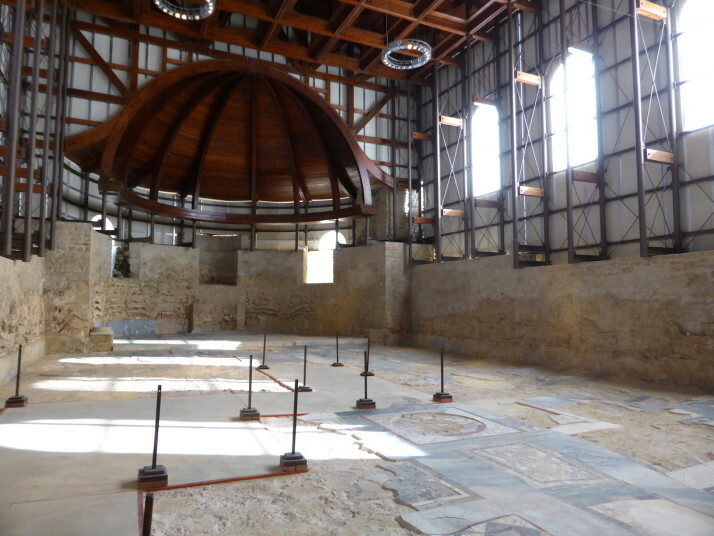 We came away with a much more rounded appreciation of Sicilian wine making and its history, and a book of wine-related quotations and thoughts put together and signed by the President himself! 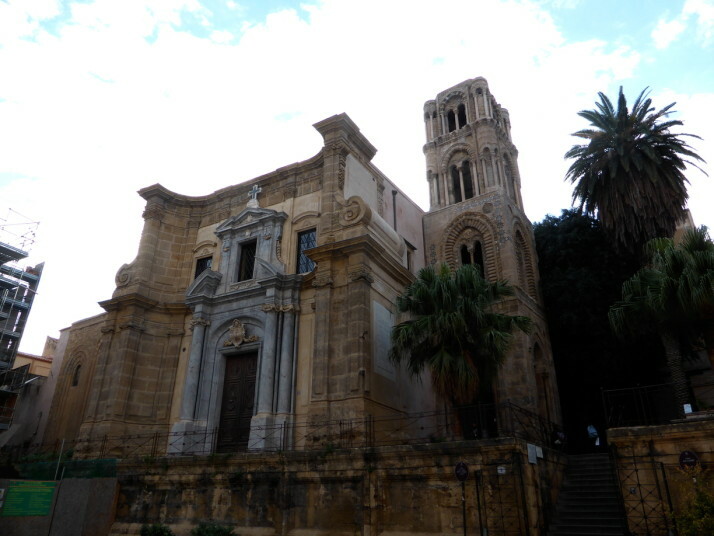 Dating back to 1143, construction of this little church was started after the Cefalù Cathedral, but before the Monreale Cathedral and the major work on the Palermo Cathedral. 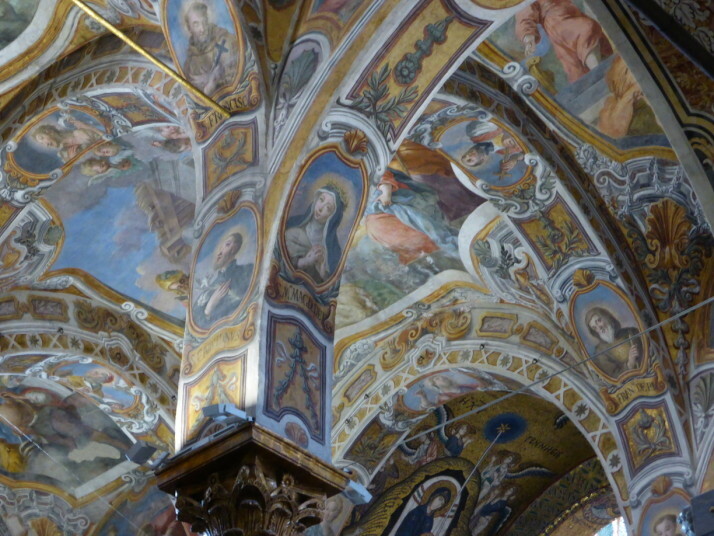 And, like those, it was on our must-see list because of its amazing ceiling.. 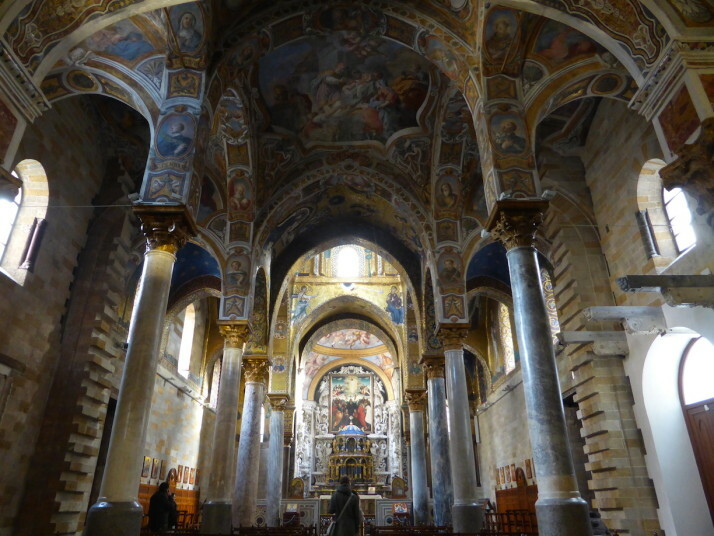 The smaller size of Martorana made it easier to take in a lot more of the decoration compared to, say, Monreale. The Martorana is a stunning little gem of a church, but we found it difficult to find reliable opening times, so for future reference here they are from the sign at the front door: 9:30-13:00, then 15:30-17:30, or during festivities: 09:00-10:30. 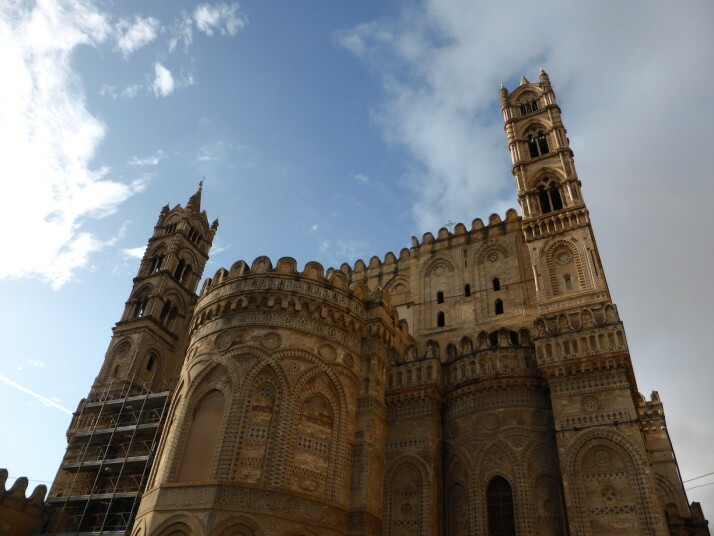 Feeling a little church and cathedral’d out, we took a change of pace and picked Palazzo Riso, the most central of the modern art museums in Palermo. 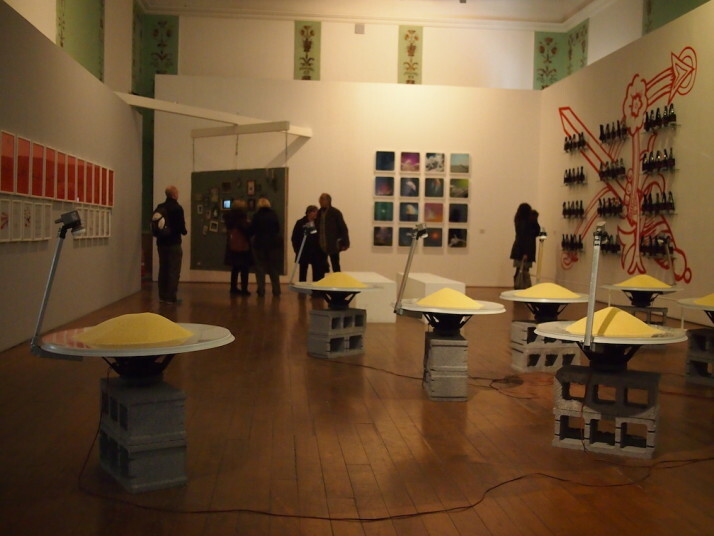 We’re not sure if the building restoration works have impacted the displays, as the galleries seem confined to one wing and spill out into the staircase, but regardless we felt a little underwhelmed or un-inspired by the works on display. 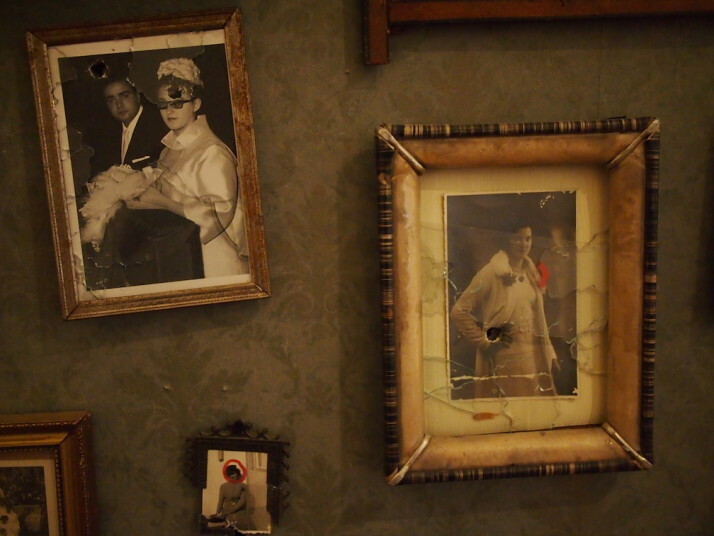 “Souvenir #3 Family Portrait” by Loredana Longo. I’m glad we’re not related.. However, there were 2 standout pieces; firstly, a section of wall of photo frames peppered with bullet holes. In the centre was a small screen that showed a video of the ‘creation’ where the artist quickly circled the faces before opening up with a handgun taking out almost all of the portraits with admirable marksmanship. But our favourite was undoubtedly the massive upstairs room full of wardrobes hung from the ceiling. We don’t know why it was done or what it means, but we like it! 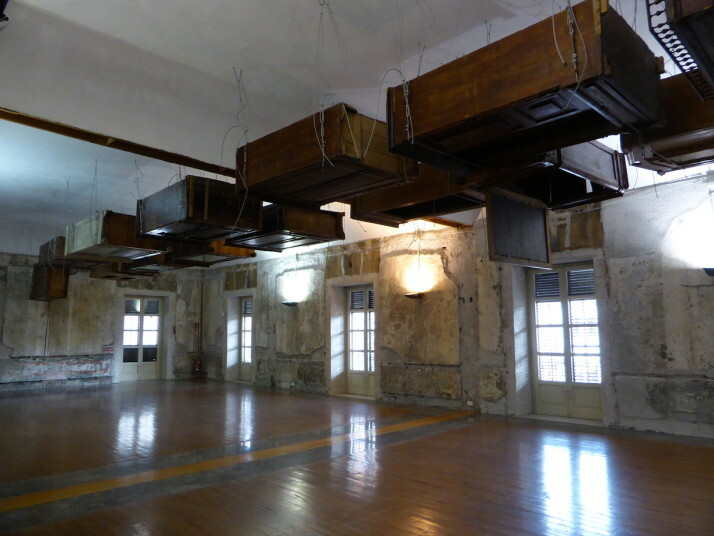 The Regional Gallery of Sicily, more commonly known as Palazzo Abatellis was a highlight for us because of the great use of space. 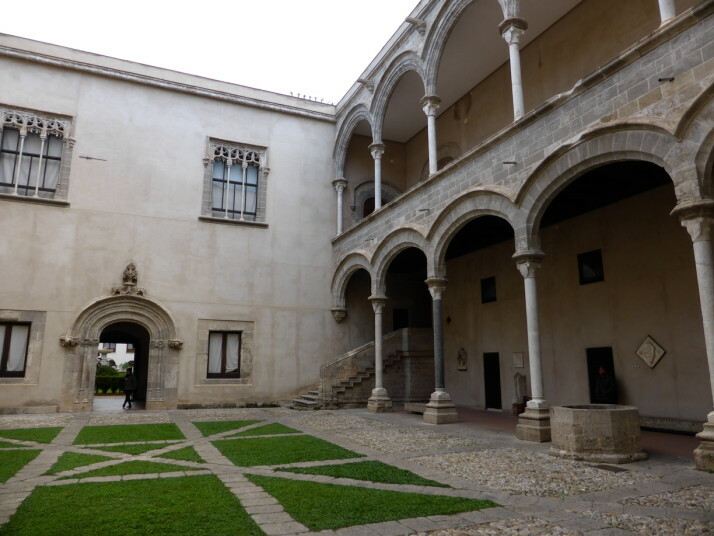 Formerly the residence of Francesco Abatellis, the port master of the Kingdom of Sicily and built in the 15th century, the building was given over to be used as a monastery after the death of the last family member. 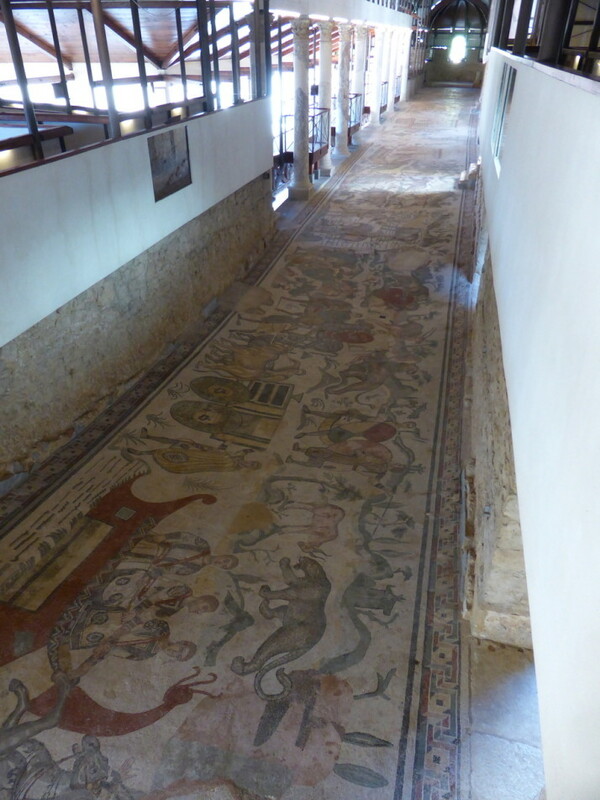 Following restoration after being bombed in 1943, it reopened as a gallery of medieval art. 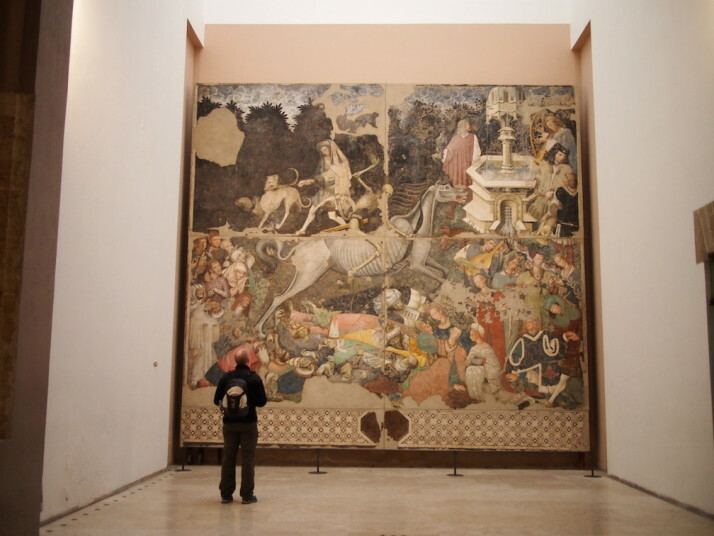 As well as the good use of space, there were 3 pieces that stood out for us in the museum, firstly the Trionfo della Morte, The Triumph of Death, which depicts an indiscriminate Death taking lives regardless of social status. We understood it was commissioned for the entranceway of a hospital! 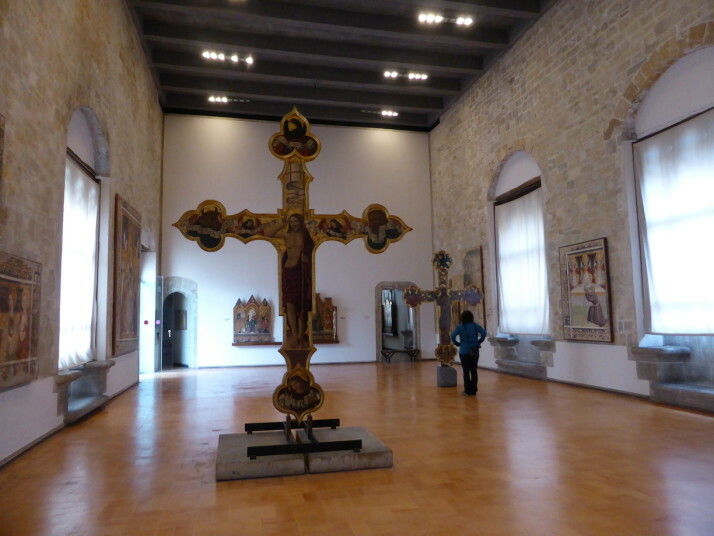 The second was the room displaying the giant cathedral crosses that are decorated on both sides. As they’re usually hung high in the nave, it was nice to be able to see examples of them up close. 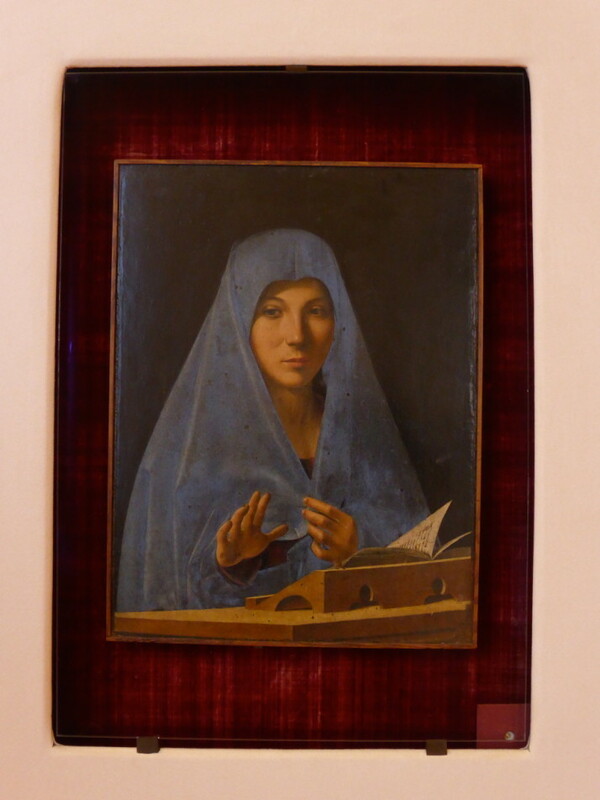 The final piece is the Annunciata, or Virgin Annunciate by Antonella da Messina, a vivid painting of Mary interrupted by the Angel of the Annunciation. It reminded us of the Mona Lisa as it’s a lot smaller in real life than we were expecting. 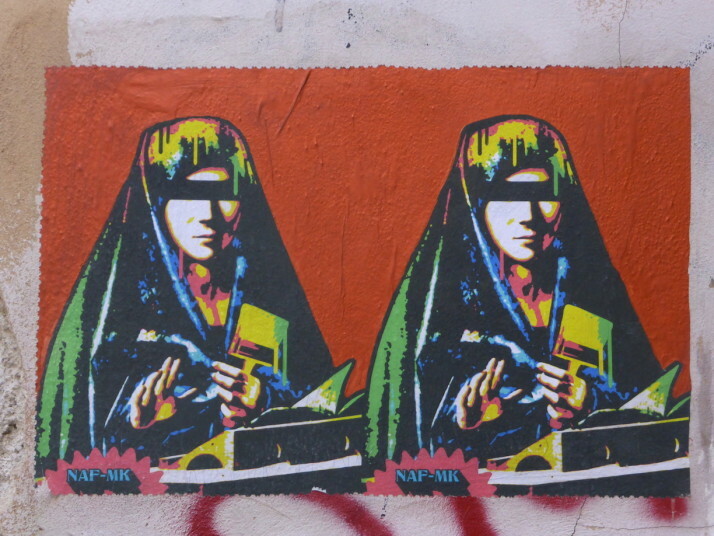 Just outside the Palazzo Abetallis I spotted a graffiti version of it..
A clever graffiti version of the Annunciata, just outside the Regional Gallery of Sicily where you can see the real thing! 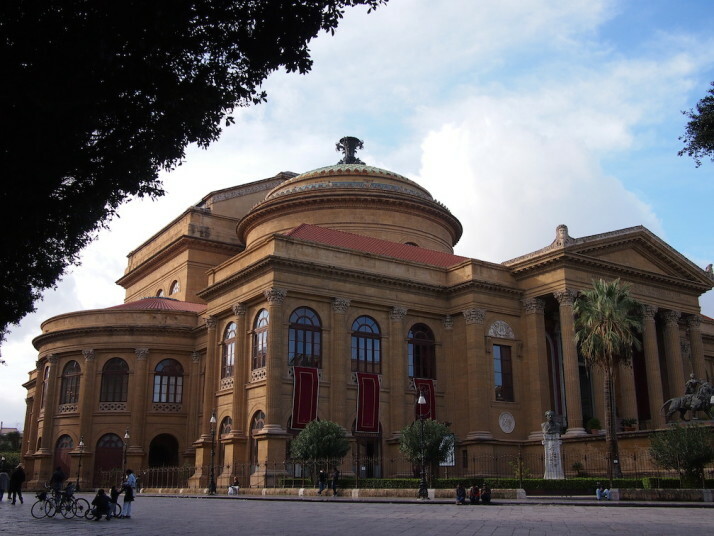 We didn’t see a performance at the Teatro Massimo, but it makes it into our highlights list because it’s the filming location of the climactic final scenes of the Godfather part III. 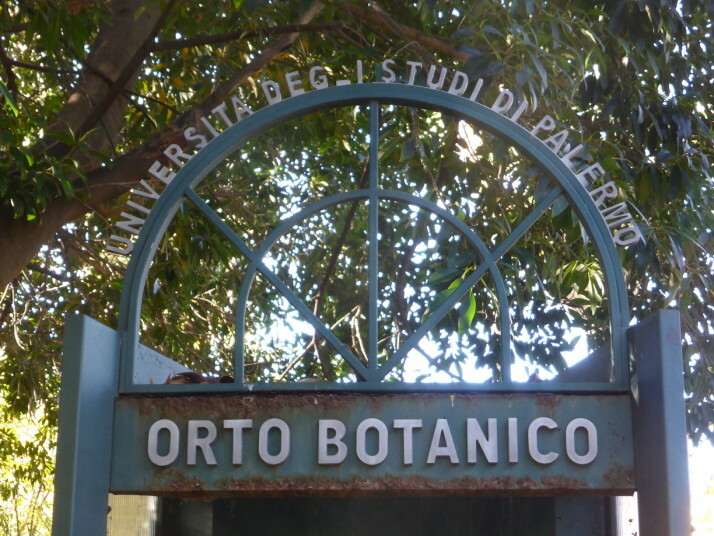 Palermo also has a pretty big Botanical Garden, and as we’re big fans of parks and gardens we spent an hour or so wandering through the varieties and exhibits on show. 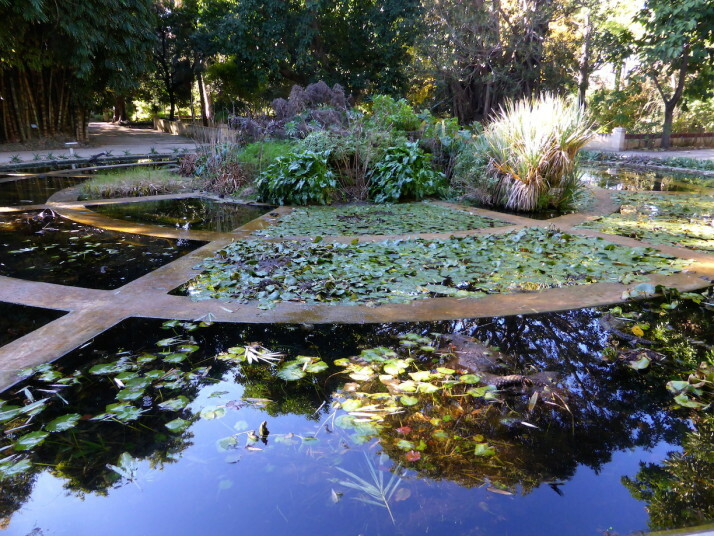 Obviously it’s not at its best in the winter months, but nevertheless it was a pleasant escape from the hum of the city scooters, and we especially liked their water-species pool which was full of lilies and home to lots of terrapins too! 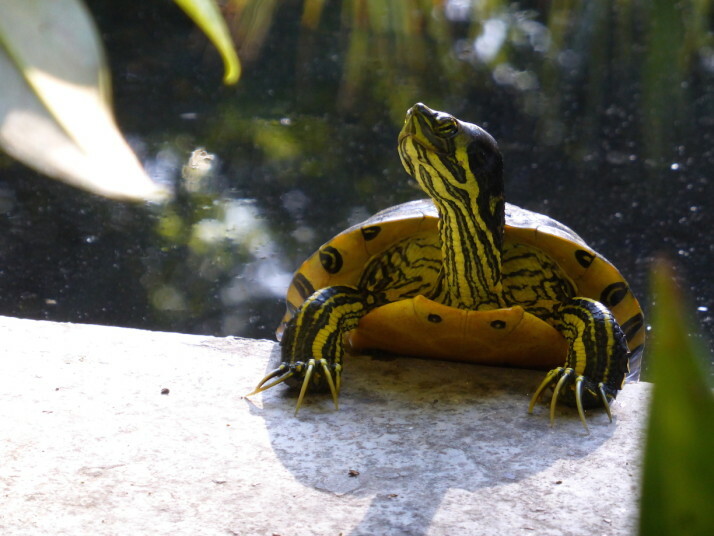 .. which was also home to sunbathing terrapins! 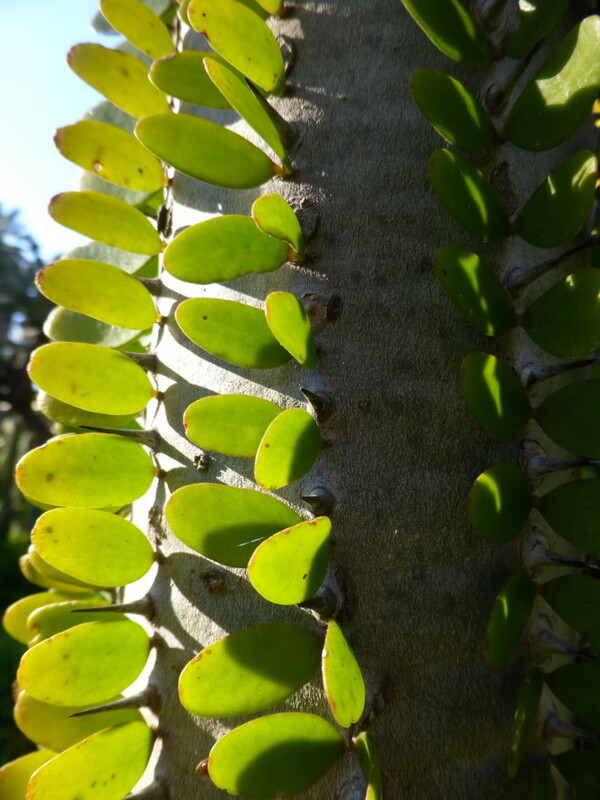 We were surprised by how eclectic the collection was – we saw plants and trees from as far away as Ethiopia and the Canary Islands, including a species of tree that has leaves and spikes that grow up the trunk – something we’ve never seen before! The very strange Alluaudia procera from Madagascar, is a tree without branches, instead the foliage grows up the trunk protected by spikes! 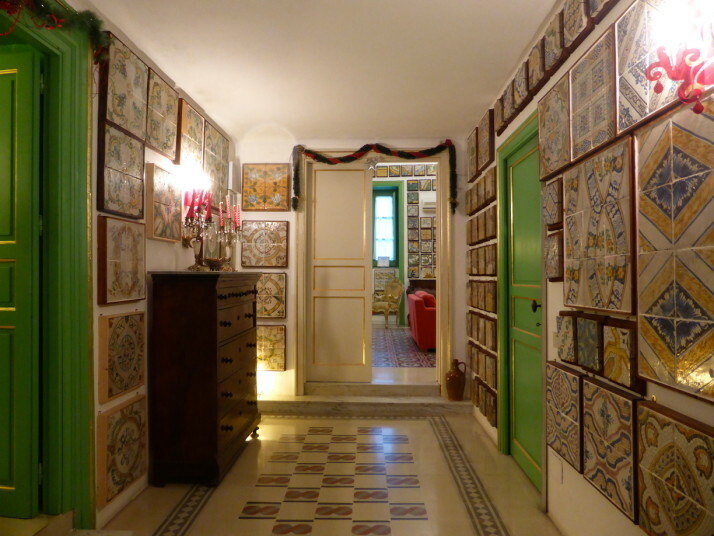 The entrance hallway of the amazing Stanze al Genio (“Rooms of Genius”) private tile collection. Wow! 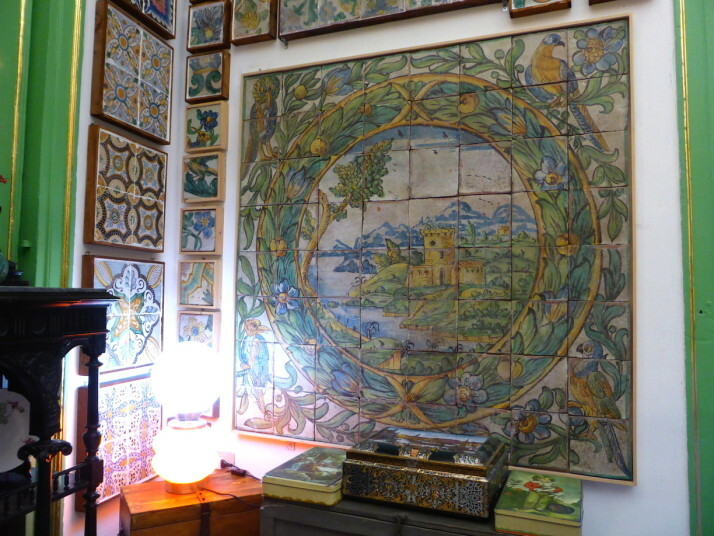 Not strictly a museum, this is actually a private collection of Neapolitan and Sicilian floor tiles from the 16th century onwards displayed in the owner’s apartment. 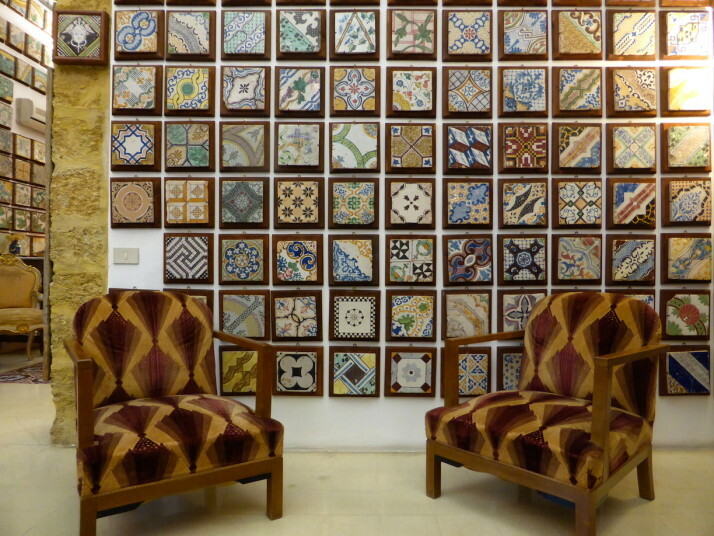 Like the Enoteca Sicilia, viewing is by appointment only so the owner can disappear upstairs to his office while one of his very knowledgeable guides walks you through the history of floor tile design and manufacture. I know, on the face of it, it sounds as dull as watching clay dry, but as soon as we stepped through the door into the hallway we saw why this is the highest rated attraction on TripAdvisor for Palermo. The collection is loosely organised by age, and the owner swaps them around occasionally. 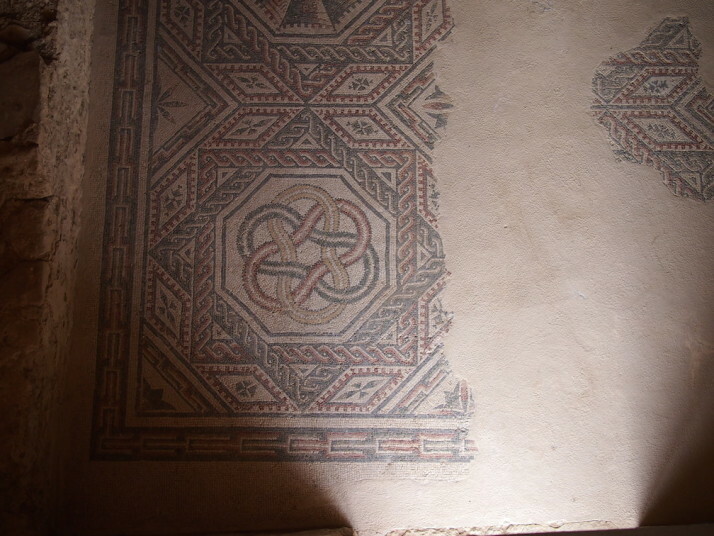 The guides try to catch him out by swapping the odd tile around too, but we’re told the owner always spots them! 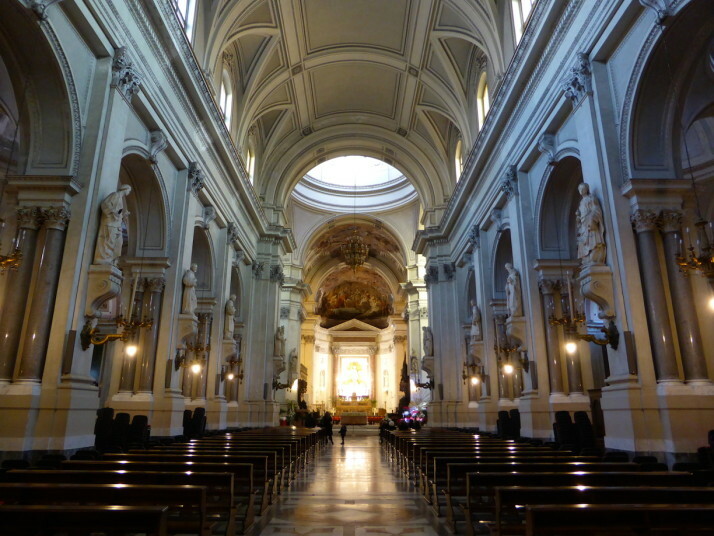 This entry was posted in Experiences, Places and tagged Art, Church, Garden, Italy, Museum, Palermo, Sicily on January 20, 2015 by Andrew.